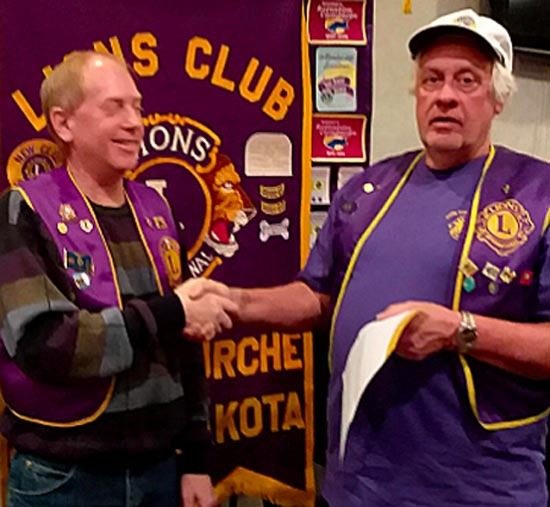 Lion Tom Nary, who seems to be active in just about every Belle Fourche Lions endeavor, was presented with his 20-Year Lion pin during the club meeting on February 22nd at Graps. Congratulations Lion Tom! The gathering was a busy one as members also received updates on the Middle School Science Fair, for which our $100 donation was divided equally among four students. Winners were 8th graders Ceylee Meyers and Theresina Seaman, and 7th graders Grace Clooten and Payge Oakes. Tickets and posters for the Lions Pancake Feed on Sunday, March 25th were shared with all members present. Lion Rich Drabek provided a New Member Orientation, which was appreciated by all members – not just newer Lions. It included a history of our 82-year-old club, along with a splendid blending of information about the scope and impact of the 1.4 million Lions members worldwide. You'll find more about Lion Rich's program – along with news about our guests and the Zone 2 meeting – in draft minutes from our February 22 meeting. Thanks to Lion Del Neumeister for the above photograph, as well as his great job with minutes from ALL of our recent Lions meetings You'll find them under the MINUTES Tab at the top of thispage.